Spacious 1 bedroom apartment close to golf, mountains and the beach, sleeps 2-3. Greenkeeper Lodge is situated in the quiet leafy suburb of Lakeside and overlooks the 13th hole of West lake Golf Club with a spectacular mountain backdrop. The highly-rated golf course and the warm welcome offered to visitors make this every golf enthusiast's dream accommodation! We offer a spacious, self-contained apartment on the first floor of the main house with private access, safe parking and accommodation for 2 guests. A private balcony and salt water swimming pool are perfect for relaxing and soaking up the sun. Greenkeeper Lodge is close to the swimming beaches of False Bay and the adjacent Table Mountain Reserves, as well as having easy access to the city's major attractions (25 mins). The Lodge is within easy reach of Clovelly and Steenberg Golf Courses and the Constantia Valley Wine Route. 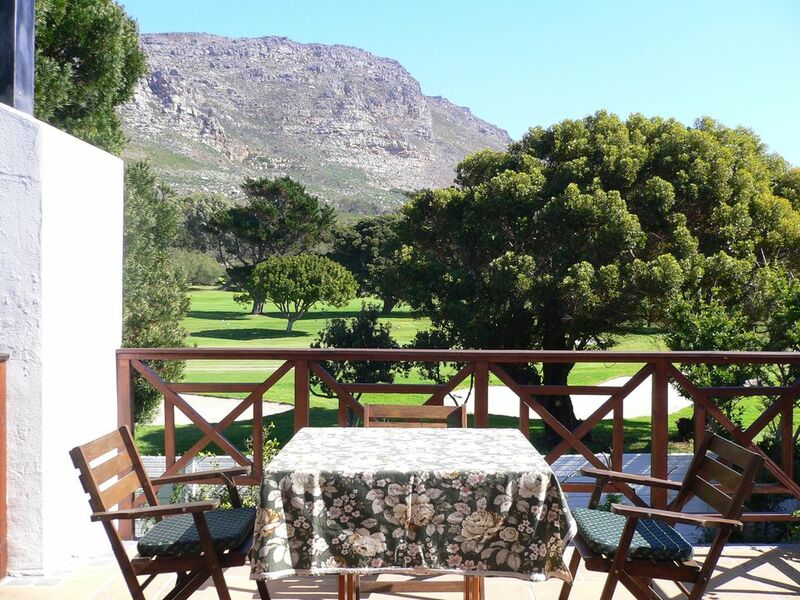 These attractions and the wide range of excellent restaurants in the vicinity make Greenkeeper Lodge the perfect location for a holiday in Cape Town. Luxuriously spacious bathroom with a large shower enclosure and bath and a view over the golf course. Towels, shower gel, soap, shampoo and body lotion are provided. A pre-paid telephone requiring vouchers is available. A gas heater and blow heaters are provided in cold weather. The washing machine is situated in the garage of the main house and can be accessed by guests. There is seating for 3 people. Staple items such as oil, condiments, a few spices, sugar, tea and coffee are provided. Also papertowel and gladwrap. A balcony with table and 4 chairs has a wonderful view of the golf course and mountains. An umbrella is provided as well as sun loungers on request. There is a second small balcony off the bedroom. The swimming pool is shared with the owners. The living room is open-plan and includes a well-equipped kitchenette and a small 4-seater dining table. The kitchenette is stocked with some basics: oil; herbs and spices; tea, coffee and sugar; paper towel and plastic wrap. Guests are welcomed with a complimentary bowl of fruit, some tea time nibbles and a bottle of wine. The washing machine and tumble drier are not located in the apartment but are available to guests and can be accessed independently. A landing connecting the rooms provides ample storage for bulky suitcases and golfbags. A fan or heater is available on request and electric blankets provided during winter. The apartment is serviced once a week and clean towels provided every 4-5 days. A salt-water swimming pool is situated in the garden and 2 loungers provided for soaking up some sun. Lakeside is situated in the heart of the Cape Peninsula, approximately equidistant (30 mins) from Cape Town International Airport, Kirstenbosch Botanical Gardens, the V&A Waterfront and Table Mountain. Cape Point and Simon's Town (penguins) lie to the south. Table Mountain National Park, Constantia Valley Wine Route, 3 premier golf courses, warm-water swimming beaches, Zandvlei Lake and beautiful scenic drives are all on our doorstep. There is the added convenience of excellent restaurants, shopping and medical services close by. Golf: Westlake Golf Club nestles up against the Silvermine Mountains and overlooks the southern reaches of the Peninsula and False Bay. This championship standard golf course has been host to the South African amateur championship in recent times.